25. Opening our list of the Top 25 PlayStation 4 Multiplayer Games is XCOM 2 The sequel to Firaxis’ award-winning strategy game takes you to even bigger risks. 22 years after Humanity’s demise against a foreign threat, the XCOM forces must rise and eliminate these alien settlers. Play online or locally with your friends because this game is lauded for its tactical turn-based guerilla combat and ridiculous RNG. Its latest expansion, however, adds more chaos to the fray. It receives a PlayScore of 24. Enter The Gungeon Devolver Digital’s unique bullet hell slash dungeon crawler takes you to an adventure of epic proportions. Follow a group of misfits as they vindicate themselves with their personal struggles by finding the gun that can kill the past. Go on a procedurally generated quest with your friends filled with lightning-fast bullets that require your lightning-fast reflexes. It receives a PlayScore of 23. BlazBlue: Central Fiction Serving as the final chapter of Ragna the BloodEdge’s story after the events of Chrono Phantasma, this fourth major entry to the BlazBlue series continues to turn the wheel of fate. With a roster of 35 characters, watch them go all out with their hyperkinetic bursts and mesmerizing color palettes. It has a PlayScore of 22. Minecraft: PlayStation 4 Edition Probably the leading source of YouTube’s Ad Revenue, this kid-friendly game makes its way to the PlayStation 4. Use the gift of imagination and creativity in Microsoft’s multi-awarded sandbox adventure. Craft, explore, fight and survive alone or with your friends. It has a PlayScore of 21. Destiny 2 Face against hordes of monsters or go for a Player versus Player experience in Bungie’s sequel. It improves on the flaws of the original’s lack of a decent campaign. Play with your friends and organize raids and Nightfall Strikes together with the improved Clan system, and receiving rewards for each other’s success. It’s the hottest game of this year and It receives a PlayScore of 20. Salt And Sanctuary Cleverly crafted to challenge amateur players with its brutal difficulty, Salt and Sanctuary is among the many games that’s inspired by Castlevania and Dark Souls. It oozes a dark and gritty atmosphere along with a merciless gameplay. Its multiplayer mode lets you grab a buddy in local co-op as you walk together in salt… and sanctuary. It has a PlayScore of 19. Battlefield 1 More than just a visual spectacle, DICE’s latest big budget title goes back to the glory days of the first World War. Packed with iconic weapons from the good ol’ days, step outside the battlefield with your squad or alone in a blazing skirmish of epic proportions. Ride tanks, warplanes, zeppelins and even play as a goddamn pigeon. It’s Battlefield at its peak and it receives a PlayScore of 18. Injustice 2 While Marvel and Capcom are busy fighting each other, DC’s very own line-up takes their chaotic world by storm. This sequel to the popular fighting game from Warner Bro’s makes a step up to the right direction. With new characters, new gameplay modes and a balanced set of heroes. It has a PlayScore of 17. Rise Of The Tomb Raider: 20 Year Celebration Celebrating their 20 years is their sequel to 2013’s reboot where she continues to follow her father’s footsteps. Multiplayer isn’t their big focus but nonetheless this sequel lets you compare other player’s scores in Score Attack or make your own rules on unique levels in Remnant Resistance. Find out who’s the best Lara Croft player out there. It’s always been a single-player experience, but it’s nice of Crystal Dynamics to add a bit of online play. It receives a PlayScore of 16. Titanfall 2 Don the greatest mechanical exo-skeleton ever made and tag your friends in an electric multiplayer experience. Thank god for its single player campaign, but the Multiplayer is where it shines. With more Titans to choose from, bask in the futuristic mayhem. Choose from among its various modes and dive into the battlefield. Grapple away from great distances, slide, wall-run, throw a grenade and call your mech from the skies, it just doesn’t get any better than that. It has a PlayScore of 15. Nex Machina A twin-stick shooter in the modern age. This cablepunk game so focused on the idea of action, you can’t even give your fingers a chance to take a break. Rampage around its robot infested world and enjoy this shoot ‘em up with a friend. Its rich co-op mode promises hours and hours of relentless bullet hell action. It has a PlayScore of 14. Doom This reboot to the classic DOOM franchise brings robust upgrades. It’s still the same first-person action we all love and it’s still as gory as ever. Be the most badass demon killer in Mars and tag a friend along. Although its single player campaign excels, its multiplayer still has a lot of adjustments left to do. But it’s an enjoyable experience worthy of your time. It has a PlayScore of 13. Rocket League The leading sports game that takes over-the-top silliness to one fun multiplayer experience. Its success transformed the game into a competitive sport with prize pools exceeding hundreds of thousands. For the beginners, the goal of the game is just so simple. Use your rocket-powered vehicle to control one giant ball, race across the pitch and score a goal. It has a PlayScore of 12. F1 2017 Codemaster’s annual Formula One release comes with a host of new improvements. Dive into its deep career mode and of course invite yourself to the game’s enhanced multiplayer. Enter the new Championship mode, and gawk at their classic F1 cars. It has a PlayScore of 11. Skullgirls 2nd Encore This 2D fighter marries creative, and engaging artstyle with controls that are both friendly, and competitively balanced. It’s the kind a of game that’s easy on the eyes, easier to pick-up, and even harder to master–making it a favorite for veterans looking for a tight duel, and newcomers looking for some multiplayer fun. It has a PlayScore of 10. Divinity Original Sin Enhanced Edition Blending deep customization, interactive environments, and tactical turn-based combat, Divinity Original Sin creates a unique and immersive RPG experience for role-playing enthusiasts. Form strategies with a friend while you’re defeating enemies, and experiment with ways to use the environment to your advantage. Throw lightning spells at water, and ignite oil barrels for an explosive finish. It has a PlayScore of 9. Dragon Quest Builders Multiplayer is a confusing aspect on most games and Dragon Quest Builders is among the many games that provide a unique online experience with your friends. This Minecraft-like spin-off from the famed Dragon Quest series lets you create your own sandbox world and share it to your friends. With its sequel looming over the horizon, let’s hope for a real multiplayer experience this time. It has a PlayScore of 8. Guilty Gear Xrd -Revelator- Arc System Works’ latest addition to the Guilty Gear franchise doesn’t disappoint everyone with its beautiful cell-animated visuals and a combat that dazzles the eyes . With a total of 23 playable characters, ranging from the cool ones to the odd. Unleash your characters blazing moves in a gorgeous arena in smooth 1080 pixels and 60 frames per second. It has a PlayScore of 7. Sonic Mania Zipping back to his pixel-perfect form, help the dashing hedgehog stop another one of Dr. Robotnik’s classic antics. It’s the same sidescrolling platform, with a few fresh additions such as the return of the competitive multiplayer where players go toe to toe with each other. It has a PlayScore of 6. Overwatch There’s no doubt about it. One of the most celebrated hero shooters of this generation is still continuously growing in population. 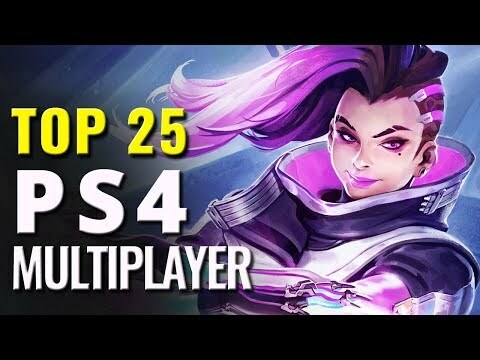 With more than 35 million players, Blizzard’s iconic shooter wins the heart of every gamer out there with its lovable cast of 25 heroes with unique personalities. Capture flags, be in need of healing, and push the payload. It has a PlayScore of 5. Diablo III: Ultimate Evil Edition A refined Diablo III experience and the second Blizzard game on this list. It brought back everything that made the franchise a success, culminating years of improvements into one ultimate experience. With the inclusion of the Reaper of Souls expansion, pick from their array of classes and relive the excitement of loot-collecting and skill-developing once more. Enjoy 1080p resolutions and 60 frames per second as you slash through demonic beasts in deep and fiery dungeons. It has a PlayScore of 4. Metal Gear Solid V: The Phantom Pain Impressive single player aside, Kojima’s final MGS entry takes a bigger focus to its multiplayer mode. Build your own Mother Base and defend them from online enemies, or you could to the same by raiding them in FOV missions. Aside from that, go into its unique game modes that offer various online plays such as Elimination and Capturing Intels. Put your stealth skills to the test and see how your MGS skills go on par with other players from around the world. It has a PlayScore of 3. Journey Thatgamecompany’s Indie masterpiece is still owning our lists. Aside from the fact that it offers an atmospheric journey with a mesmerizing soundtrack, it also shows a genuine online experience. Players can meet other players in the vast desert, but they cannot communicate. Use musical notes and help solve puzzles together. It’s a stellar feat and it requires no stress. It has a PlayScore of 2. Grand Theft Auto V Of course, Rockstar’s latest giant isn’t giving up as well. We already know how huge the world is, especially its cast of characters. Shark Cards aside, its online mode lets you play around its world with infinite possibilities. With a group of friends, cause mayhem and havoc around Los Santos or do heists with friends. It’s the ultimate GTA Online adventure and it has a PlayScore of 1. And the best Multiplayer Game on the PS4 is Uncharted 4: A Thief’s End Okay, let’s face it. It may not be the most multiplayer-centric entry on the list, but it does provide a fun experience to the fans of Naughty Dog’s third-person combat. Customize your own character and use a wide range of abilities to dominate the playing field. Use your hook or the games mystical items to gain edge in battle. There’s so much more in its multiplayer mode and to this day, it still continues to wow players due to its consistent action, physics and realistic features. It has a PlayScore of .